A simple phrase, uttered by the angel Gabriel in today’s Gospel, recited by many of us multiple times a day in the Hail Mary during a rosary, and heard in a slightly modified way, The Lord be with you, many times during our Eucharistic liturgy. Do we consciously hear it? Or is it one of those phrases we hear or say while on automatic pilot, not really giving it any thought? I admit, I’m guilty of that often. Do we believe it? The Lord is with you. If I change it slightly, The Lord is with me, can I believe it and accept it? I would say yes, on my good days. How can we help ourselves believe and accept that all the time? The Lord is with me, The Lord is with you, The Lord is with us. The Lord is with you. What was it like for Mary to hear those words from the angel Gabriel? As each of us reflects on Mary’s encounter with the angel, you may have an image that comes to mind. It may be Sister Mary Charles’ icon in our foyer, Fra Angelico’s fresco and a print of it is in the upper kitchenette, or the photo mural that is just outside the community room. Recently, the painting by Henry Ossawa Tanner, located in our monastery just outside the Rising Sun group room, has struck me in a way that it hasn’t before. 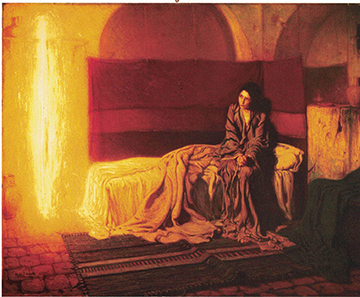 The Virgin Mary is in this ordinary room, sitting on her bed, hands clasped in prayer, looking towards the light of the angel, pondering the message he just shared with her. She heard the Divine Voice calling to her. Did she struggle to accept Gabriel’s message, that the Lord is with her, in the ways I struggle to accept that phrase in my life? What was her prayer as she pondered these words and listened to Gabriel’s explanations? Throughout my years in community, one of the closing prayers from Midday Prayer has always touched me. I took a copy of it with me while I was away at graduate school. At this point, I now have it memorized. It has become my daily prayer for our community. I pray it for those who came before me, creating the foundation of this community. I pray it for us now, as we faithfully live the monastic way of life today. I pray it for those who will come after me, who will continue to serve the needs of the people of this area. Raise up, O Lord, in this community of the Annunciation, the spirit which animated St. Benedict and St. Scholastica. Filled with this same spirit of the Gospel of Jesus Christ, may we study to love what they loved, carry out in our lives their teachings, and listen to the Divine Voice calling to us in this time and in this place. May each of us listen to the Divine Voice calling to us, today and every day. May we trust and believe that the Lord is with us.